Latifa Sayadi is a Tunisian/German artist blacksmith and sculptor based in Berlin, Germany. There she runs a workshop where she creates her sculptures and commissioned pieces. She is also interested in exposing the works of female blacksmith's. In 2008 she finished and published her documentary film about women blacksmiths, Queens of Iron. 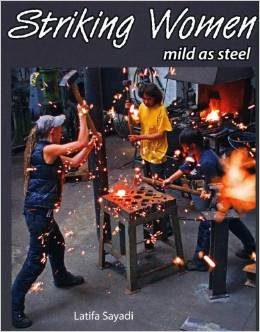 This book is a 'striking' testimonial to women's great contribution to artist blacksmithing! Henriette Abitz, Wendy Alford, Elspeth Bennie, Christin Boyd, Bex Clark, Colleen du Pon, Lisa Elias, Roberta Elliott, Bianca Fattler, Rebekah Frank, Nana Furuya, Sandra Geruschkat, Najet Gherissi, Breon Gilleran, Bethan Griffiths, Mary Hackett, Katharina Hahn, Christine Holt, Annie Jansen-Thielen, Paula J. Jenson, Miranda Jones, Eveline Kesseli, Katja Kleutges, Kristina Kozak, Nancy Linkin, Annabel Liquori, Catharine Lloyd, Shawn Lovell, Ulla Lutz, Corrina Sephora Mensoff, Lynda Metcalfe, Kathrin Meyer, Marsha Nelson, Lauren Osmolski, Laura Parker, Edda Sandstede, Latifa Sayadi, Bex Simon, Kelly Smyth, Kiki Sting, Shelley Thomas, Cara Wassenberg, Orit Winberg, Tessa Wittman, Maja Zbinden-Jermann, Marja Zilcher.